I distinctly remember the first time someone “booed” our family. We had recently moved into a new neighborhood (the very same one where I met and became friends with Steph in fact) and were innocently relaxing at home when there was a quick, loud knock on our door. We opened the door and found no one. But before we could even consider that we might have been struck by a cruel doorbell ditcher we found some delicious fall cookies on a plate. At first, we had no idea what was going on. It quickly became evident though by the poem attached to the goodies that explained “You’ve Been Booed” by some friendly ghosts. Obviously, we loved that this had been done to us. We felt welcomed into the neighborhood immediately and had a lot of fun speculating on who might have been the culprits on our doorstep that evening. As a family, we enjoyed working together to make our own treats while we took special care to choose two more families in the neighborhood to go “boo” ourselves! As a result, this has become one of our favorite traditions of the year. 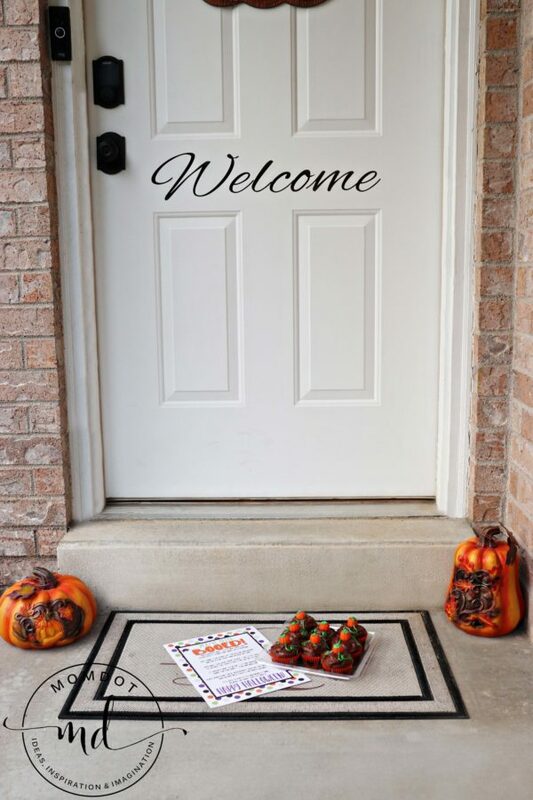 It’s such a cute, quick and fun way to kick off the Halloween season. Now that October is here my kids and I spent time this weekend doing just that. We quickly whipped up a batch of Pumpkin Patch Cupcakes to use as our treats. The excitement in our house was palpable as we gathered the printables I had made. We loaded in the car to make our deliveries. We laughed and chatted as my children planned their deliveries to a “t”. They love when I give them permission to actually doorbell ditch our friends. Of course, the most important thing is to never get caught! Are you like me so long ago and have never “booed” someone so you’re wondering what in the world I’m talking about and how to go about it? Let me help you get started! You’ll love it! First, gather some goodies to share with a neighbor. They can be something simple like a cute little bucket full of candy corn. Even better, make something with your kids! For example, our Nutter Butter Mummies, Ghoulish Ghosts, Perfect Peanut Butter Acorns or Pumpkin Spice Cupcakes with Cinnamon Cream Cheese Frosting would all be perfect for this activity! Second, print off the two pages below to leave on the doorstep with your treats. One page is the instructions. It explains to your friends how to play this neighborhood game. I think the fact that’s in poem form just adds to the whimsy. The second page is the We’ve Been Booed! sign that they will place on their door or window, letting everyone know they’re house has been hit. 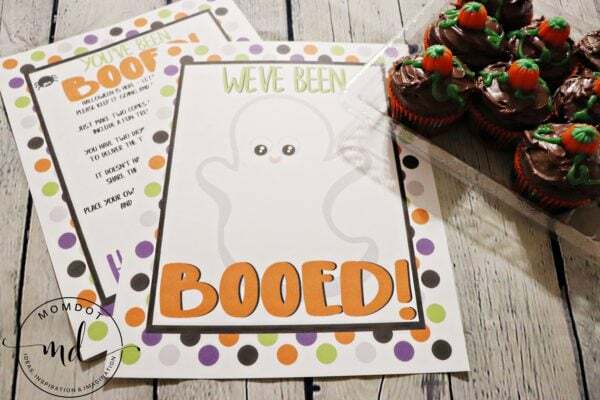 Third, put the treats and the printables on the porch of the person you’ve chosen to “boo.” Ring the doorbell and RUN! You don’t want them to discover you. Last, have fun as you watch the signs pop up all over your neighborhood. 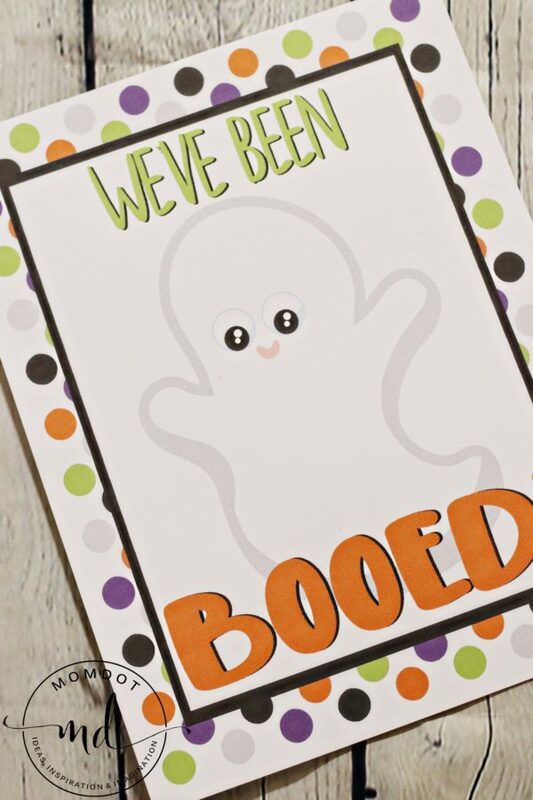 You’ll love seeing family after family continues the tradition of “booing” each other! Click here to print off the instructions. Click here to print off the sign that neighbors will hang up. Have fun “booing” people all over your neighborhood! « Kitchen Knife Types: What Are the Different Types of Knives?